Designed with the proper width, rearward angle and back swell to distribute recoil energy evenly into both hands resulting in greater speed, accuracy and control when shooting. 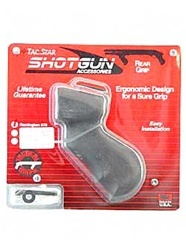 Injection-molded from a high-impact ABS polymer, Tactical Shotgun Grips include all the necessary hardware for quick and easy installation and require no alterations to the shotgun. Front and rear grips sold separately.